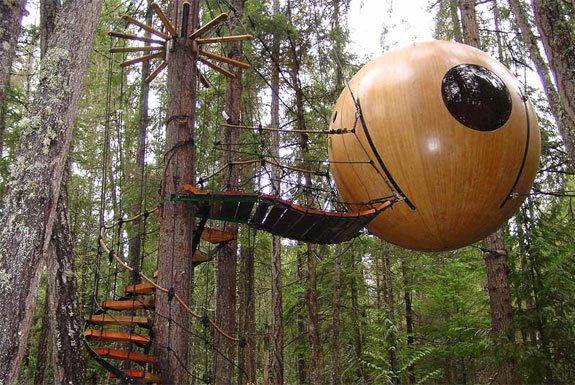 The Swiss Family Robinson meets Cocoon on Vancouver Island in British Columbia, Canada. 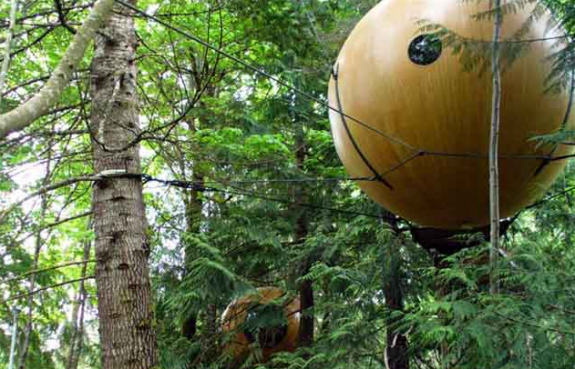 There, on the island’s western coast, is a a gem of an eco-resort where guests sleep in round pods suspended by ropes in the trees: the Free Spirit Spheres. 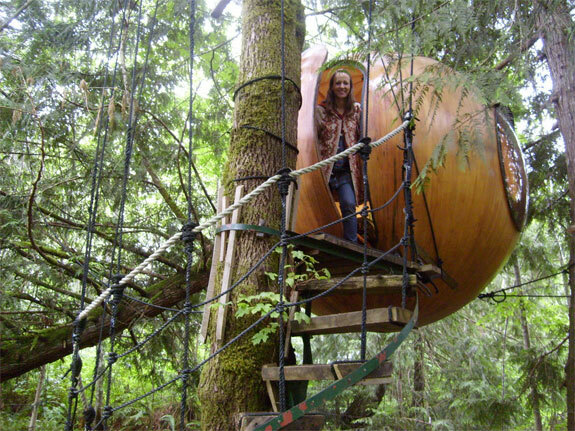 The “Spherical Tree House” accommodations of Free Spirit Spheres are not exactly spacious. 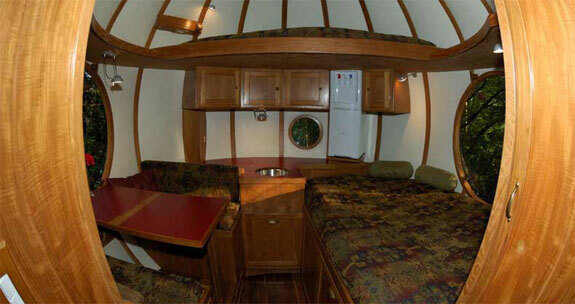 But they do make efficient use of the room that’s available, much like the sail boats that inspired their design. In fact, when a wind blows the pods sway much like a boat does. There are three sphere-pods to choose from. All About Melody is the newest; it is the most secluded and the most accessible, reachable by a flat and (mostly) steady foot bridge. 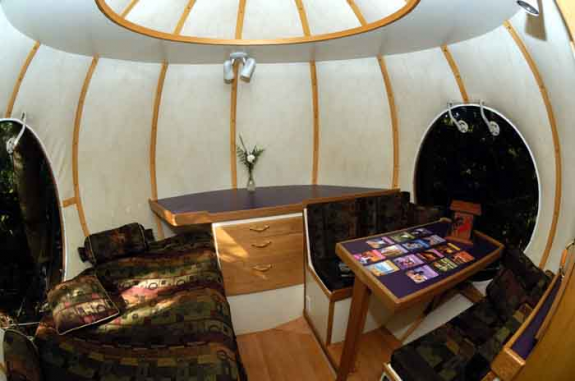 The Eve sphere is the coziest (by which we mean smallest); it only has room for one average sized adult or two small ones. 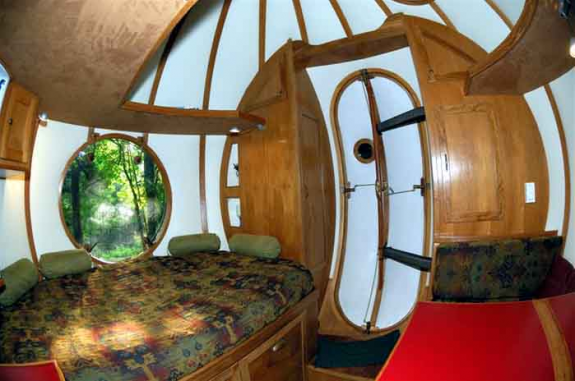 Our favorite sphere is the Eryn (photo to the right) largely because it hangs highest above the ground (4.5 meters / 15 feet) and has a huge round window next to the bed. 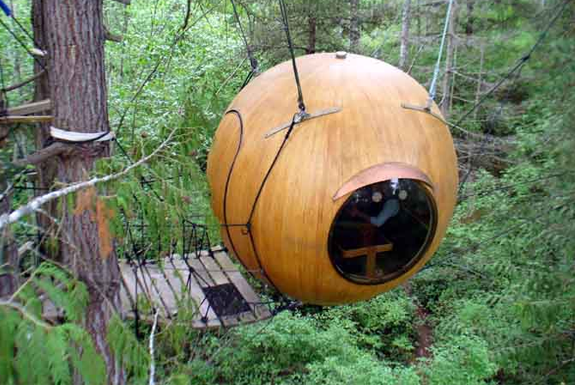 The Free Spirit Spheres might be the world’s only resort that has a sauna and has its accommodations wired with a high tech stereo but doesn’t offer a bathroom with plumbing. Guests use an outhouse for their facilities, so bring a flashlight. 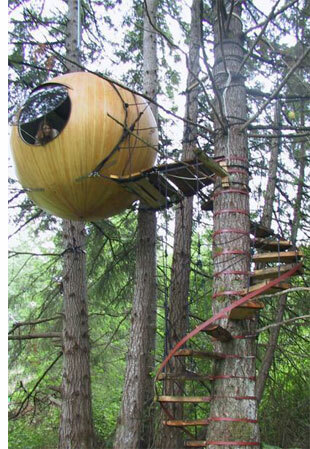 And bring your iPod, hook it up to your sphere’s speaker system, and experience a whole new type of surround sound.